This is the first in a series of six blogs. As many of you know, I’ve designed a model called Optimistic Leadership. It involves five commitments. My colleagues encouraged me to invite conversation about each of the ideas – bit by bit. So here’s the first – what does it mean to make a commitment? 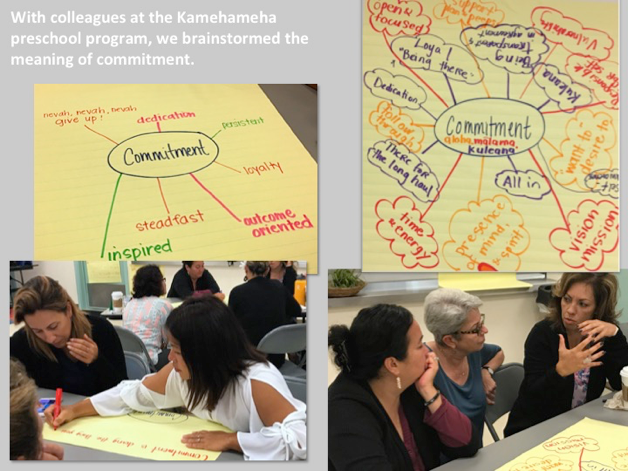 In a recent workshop with forty early learning leaders, I posed the question, what does commitment mean to you? The answers were rich and diverse: steadfast, willingness, all in, dedication, inspired. We laughed together when one group looked online and found this quote: Commitment is doing the thing you said you’d do long after the mood you said it in has left you. The idea of commitment resonated for all but in different ways for each person. After sharing ideas, stories, and reflections, the group added these commitment words: goals, intention, purpose, self-awareness, and reflection. I believe that commitment is vital if we are to achieve the high quality programs children and families deserve and that the early learning professionals deserve as well. Commitment takes effort and persistence and it is more likely to become a part of the culture of programs when it is a shared endeavor. Laura Lamothe: Commitment is about persistence even when facing resistance and not compromising on what you said you would do even when compromise feels like the only option. Nichole Parks: Commitment is making a choice to identify and follow through with the steps it will take to meet an identified goal or vision. Cate Curtis Heroman: It’s about the ability to stick with a dream for a very long time. What does it mean to make a commitment? I think it means that you feel passionate about the issue and are willing to do the work and remain persistent even when the going gets tough. Why do we break commitments? Perhaps we haven’t thought through what’s really involved and what it will take over time to maintain investment. I invite you to think about the concept of commitment and how you feel about your work. Are you committed? Do you feel a sense of commitment to early learning? To your program? To your team? What would it take for you to be “all in” and fully committed to your role as an educator of young children? Please comment here and I’ll make comments available on Facebook as well. Commitment is really a STATE of mind. As we all get pulled and tugged in different directions-it is the stance of COMMITMENT that holds those chaotic feelings at bay! It was a wonderful experience for all-sharing and empowering the LEADERS WITHIN! To begin with for me commitment means doing what you say and saying what you do. It means being willing to take the extra step. In terms of being a committed EC educator I would say commitment is about seeing your role more globally than what is happening in your day to day environment. It is about being willing to take risks in the name of what you believe in, it is about constantly learning, it is about speaking out, and it is about recognizing all children and families deserve accessible, affordable high quality early childhood programs. Kelly – I think that the idea of the extra step is so important. Too often our colleagues are watching from the outside in – deciding whether even to take a first step. thanks for your thoughts. Thank you for encouraging this conversation Judy! Next a person might make a commitment to an idea or movement. In doing so, a person is choosing to believe in the power of change. From this position comes strength to act for the betterment of the whole. It also provides a support network of like minded individuals that allows for opportunities to strengthen and improve actions through conversations and problem solving. As an optimistic leader, inevitably comes the commitment to those with whom you lead. This commitment might be towards an individual, a small group, and/or a large group. In each, one makes a commitment to support others by provide a holding environment where others feel safe and capable to grow, develop and try new things. Ultimately, each form of commitment comes from a place of making a difference and positively affecting change.